It was misty again this morning so I delayed my start until after 10 am in the hope that it would burn off. Despite the poor state of the B&B I had slept really well, lulled by the roar of the East Lyn River right outside my bedroom window. 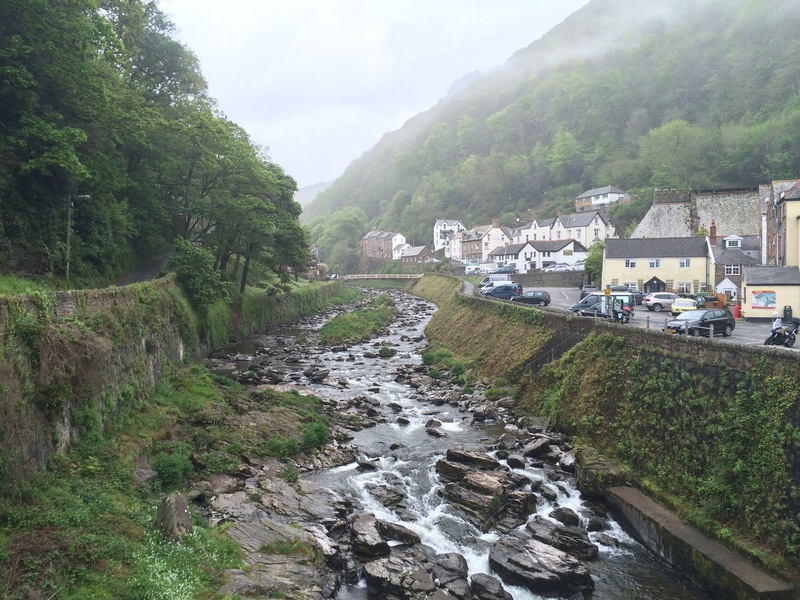 I meandered along the main street through Lynmouth, which didn’t exist until after the flood of August 1952. Before then there was no road, only a wider river. The flood destroyed lots of the town, including the lifeboat station. Lynmouth is now a popular tourist destination but there was no queue this morning to get the cliff railway up to Lynton. 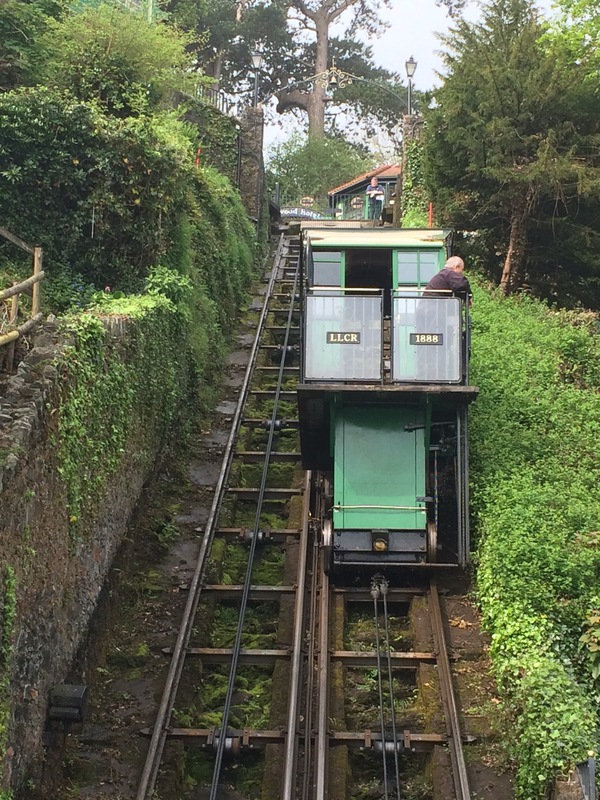 It was the steepest cliff railway in the world when it was built in 1890 and it has been running every year since. It is powered using the potential energy of water from the West Lyn River. This was definitely easier than walking up the cliff! 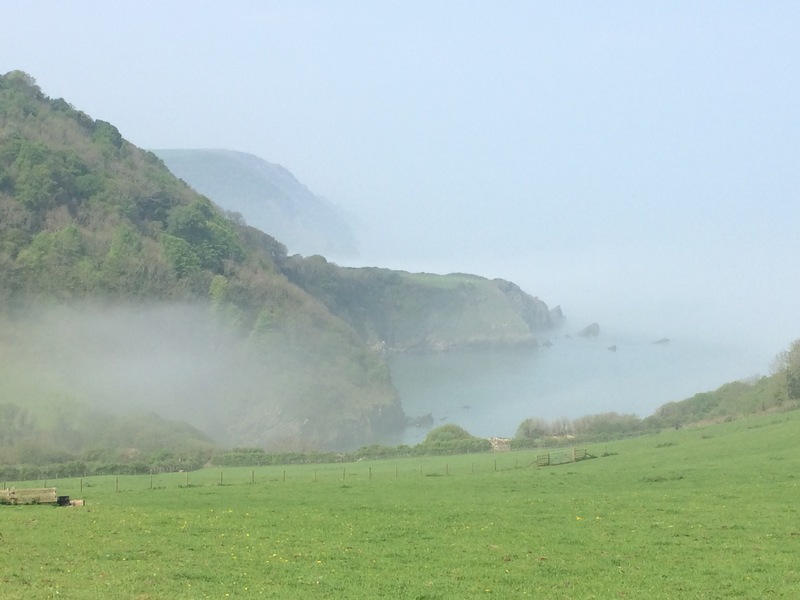 I was still enveloped in mist as I left Lynton and skirted around the cliff edge. 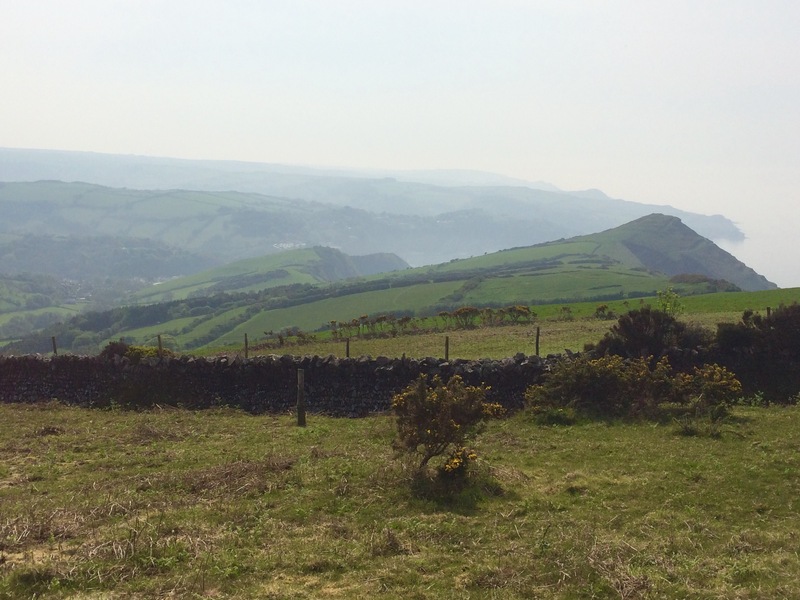 The mist started to clear in patches and I could see the blurt-green sea below; it was a beautiful sight. 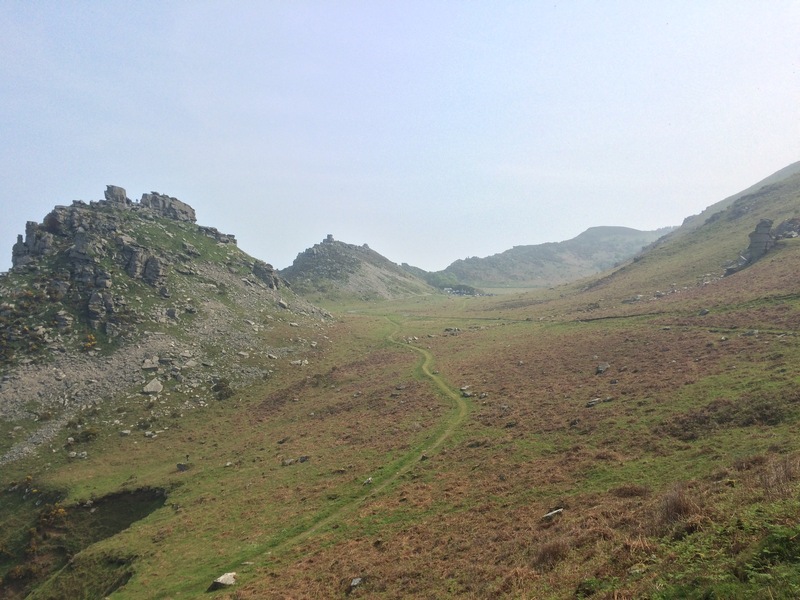 I entered the Valley of the Rocks, a dry valley high on the cliff top. The rock formations were stunning, and it was possibly more atmospheric with the mist swirling around. More smiles! More woodland covering steep cliffs. I was glad of the shade because it was already hot and the sun was burning off the mist. 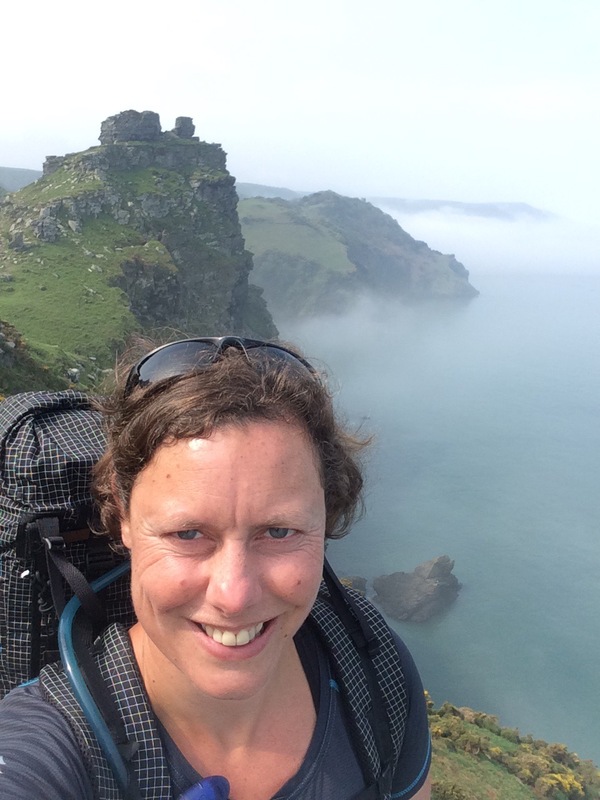 I descended down the steep track to Woody Bay (a bit off the coast path). I wanted to see where I had been on a family holiday aged 13 months, and the rock in the middle of the beach that I had climbed up after escaping from my parents. 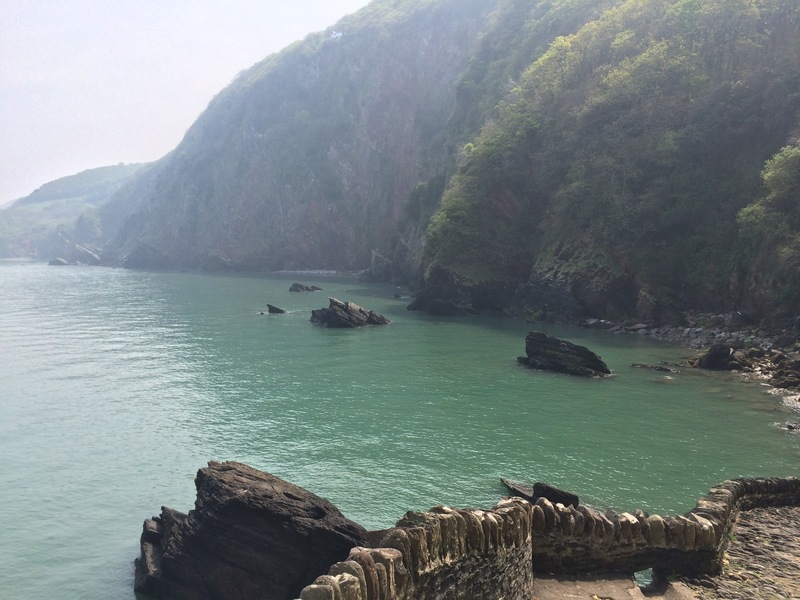 The tide was in so there was no beach, but I could see the rock and just how peaceful this bay is. It was a steep climb back up to the path and out of the woods. All of a sudden the sky was bright blue, the sea a milky greeny-blue and the views became more expansive. The walk also got tougher from here. I caught up with Bernadette, who was walking with 2 English guys: Andreas (definitely not German) and John. We walked together up to Highveer Point and there we met Jarmo and Petra who were stopped for a break. Jarmo was dishing out coffee made with his portable espresso machine! 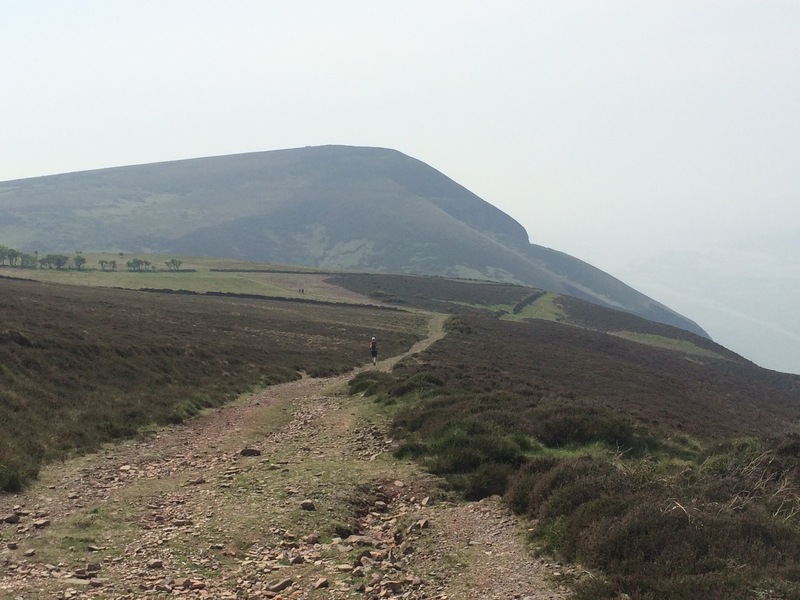 The next section was a big descent into Heddon’s Mouth Cleave and an extremely steep climb up the other side. We all set off together but went at our own paces. 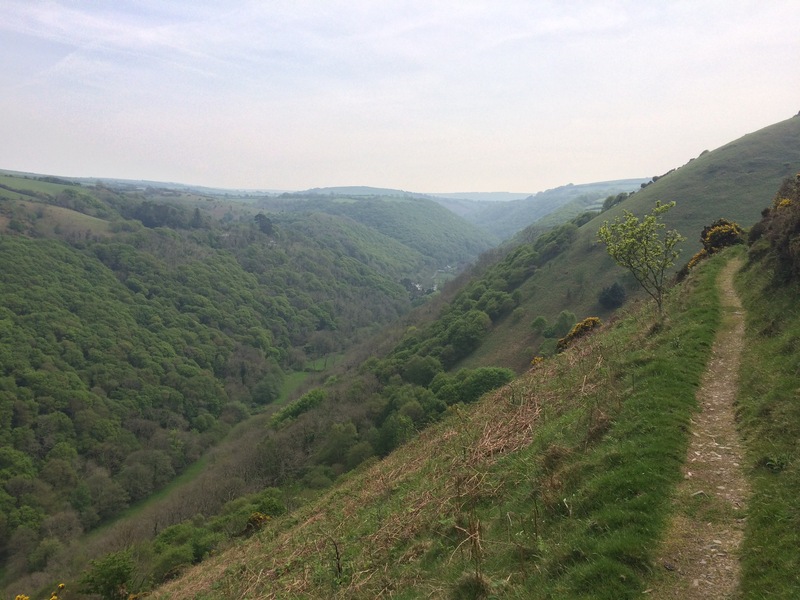 Jarmo and I were so busy chatting when we reached the River Heddon that we missed the turning up the hill and did an extra half a mile to Heddon’s Mouth. It was extremely hot scrambling up to the top of the cliff again. I worried that I might run out of water and get sunburnt. Still, the views along the cliffs were outstanding and I soon left everyone behind and enjoyed it on my own. 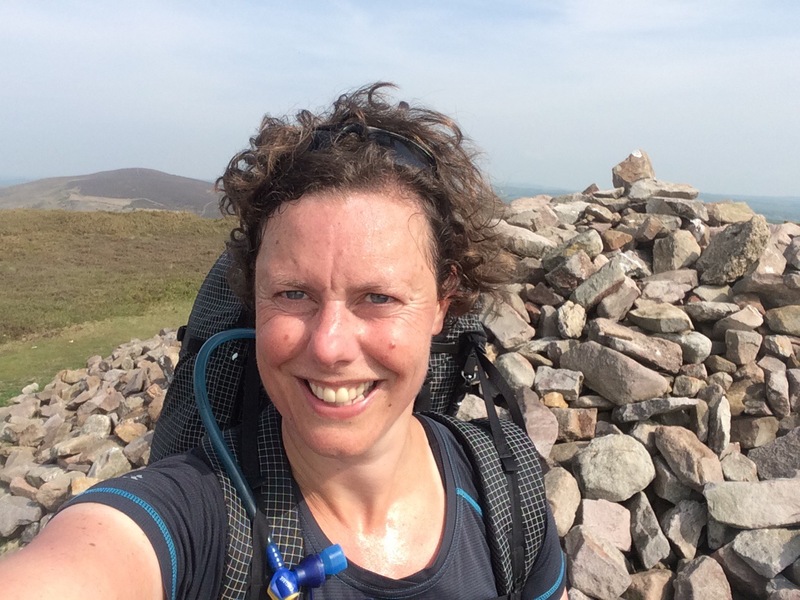 I walked over Holdstone Down and had one more big descent (-140m) and tough ascent (+190m) to cross the small stream of Sherrycombe and reach the highest point of the day at Great Hangman on Girt Down. 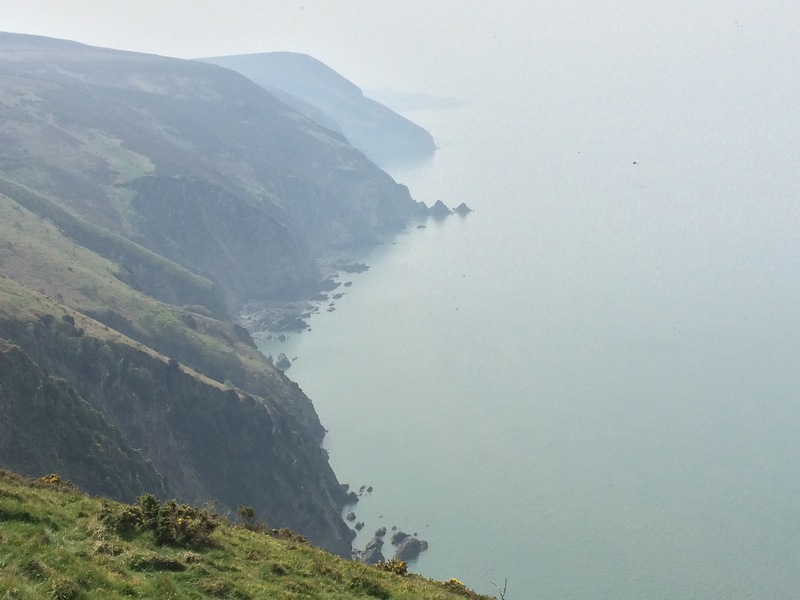 Although it was a bit hazy the 360 degree views were still amazing and not only could I see all along the cliff tops, but I could see right into Exmoor as well. 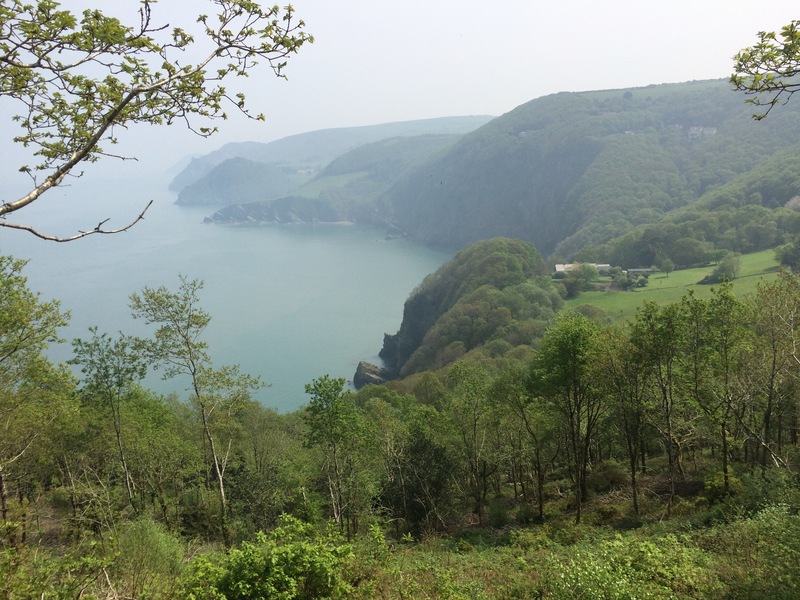 The path wound down hill to Combe Martin; however, I decided to veer off and climb up Little Hangman just to be sure I wasn’t missing another amazing view. 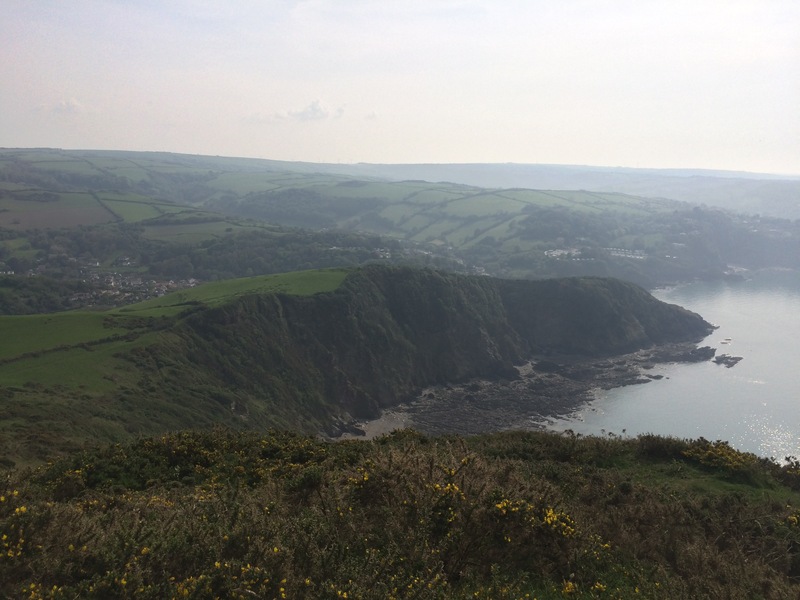 I was glad I did because I did get a great vista across Combe Martin Bay to Widmouth Head. 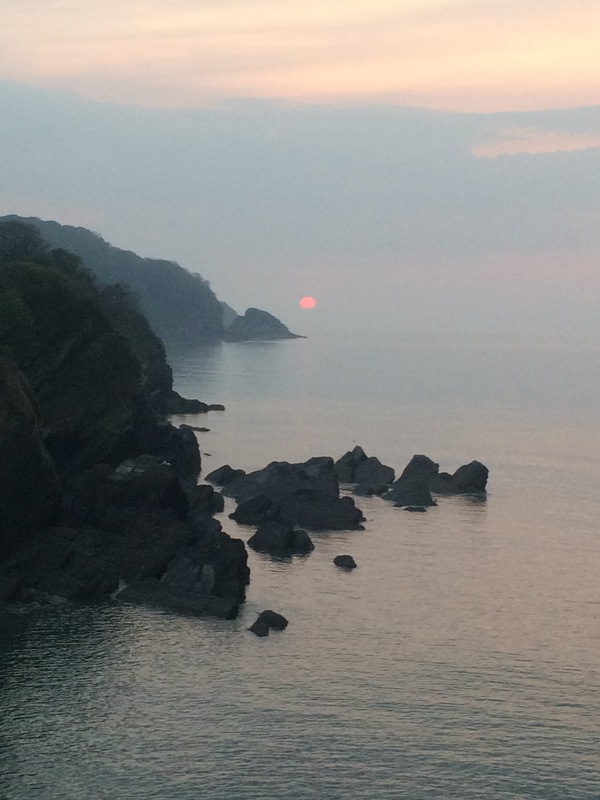 It was just after 5 pm when I arrived on the edge of Combe Martin. I was tired, hot, hungry and thirsty. Only a small hill to walk to the campsite! It was a lovely site, managed by a couple from Wolverhampton. No sooner had I put my tent up and had a shower than Bernadette arrived and Andreas and John were also here in their motorhome. So it was an evening of chatting and drinking beer and baileys (all the guys had) sat outside the motorhome. Eventually I did manage to drag them all to the nearest pub for some food (we only just made it before they stopped serving). It was a very late night/early morning when I got to bed. It had been a great day though, and a tough walk. I was right you have entered Middle Earth with mobile expresso machines….I am expecting to see Gandelph at any time…..awesome pics and a beautiful sunset. Cannot wait to read the next days summary which you obviously started with a thick head!!!!!! Well Done Juice very envious. No thick head. I was good.